Lyons Press, Guilford, Connecticut, 2012. 242 pages. Full disclosure: Colleen Mondor is an acquaintance whom I like very much. It seems a little presumptuous to call her a friend, but I’m confident that eventually, after enough KidLitCons, we’ll be that. She hosted the last one I attended in Seattle, and I’ve definitely read her blog, Chasing Ray, many times. Today I was on her blog for an Unconventional Blog Tour, where she gave an insightful post about Bloggers and Authors. She mentioned that it’s been six months since her book came out, and it dawned on me that I really need to get her book reviewed! So watch me go! I got home from work, and I’m writing the review! Now, I should point out that there are two main reasons I took so long to review this book, and neither one has anything to do with how much I like it (very much). 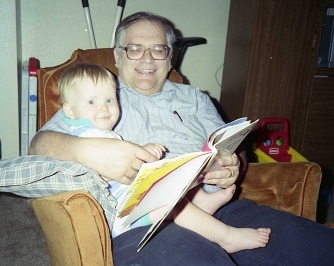 The reason Nonfiction slows me down is this: I learned many years ago that if I read nonfiction at bedtime, I will think about it, and I won’t be able to go to sleep. Sometimes fiction does this, but not as often as nonfiction. So I read nonfiction sitting at the table, either eating or knitting while I read. What’s more, I rotate books. I’ve got a hugely complicated rotation system. Generally, every day I read a chapter of inspirational nonfiction, one of narrative nonfiction, and one of informational nonfiction. With the other two categories, I even rotate books within categories, but I’m finding that with narrative nonfiction (like this book), I tend to stick with one book until I finish, though I usually do just read one chapter a day. This book worked well with that method, since almost every chapter is essentially a story in itself. The chapters do work together and do have an overarching theme, but they definitely work as separate stories. And I have to say, there were many times, and more and more as the book went on, when I definitely couldn’t bring myself to stop with one chapter. I also had an interruption in reading the book when I flew to ALA Midwinter Meeting in Dallas. This is decidedly NOT a book you want to read on an airplane or within about a week of flying on an airplane! It will not be a spoiler to say that many pilots die in this book. The reason owning the book slowed me down is that continuing problem of it, unlike library books, not having a due date. I am getting better at putting my own books higher in the stack to be reviewed, or, well, at least I thought I was. But apparently I still have a ways to go. Because I did finish it quite some time ago. In The Map of My Dead Pilots, Colleen Mondor tells stories from her days of working for “The Company” that had a flight business in Alaska. Her stories are eye-opening and amazing. She helps you understand how people could fudge on cargo weights in order to get the job done — with possibly life-threatening results. She talks about the many factors that sometimes lead to narrow escapes but sometimes lead to disaster. She talks about the kinds of people who end up living a life of adventure in Alaska. The whole thing is completely fascinating. Sometimes in the way that a train wreck is fascinating — in this case, I should say the way a plane wreck is fascinating, because there are several of those. Though they don’t always find the wreckage. The book reads like friends sitting around and telling yarns. Colleen admits that they don’t sound believable, so it’s a treat when she’s with someone who was there and knows it’s all true. Sam Beach . . . didn’t see himself as Ben Eielson, heading to Fairbanks in 1922 on his way to fame and glory as the first pilot to fly across the Arctic. By 1995 commercial flying in Alaska wasn’t really about the bush anymore; it was about commuter schedules and hauling mail and building flight time to get a jet job. But he still had that same vision of Eielson’s in his head. This time it would be different; this time the job wouldn’t go away; this time he would make it. Sam had been in aviation long enough to know what Alaska meant; it was the place where pilots were needed, where they mattered. This is my chance, he told his parents, and he said it just like Eielson did so long ago, with promises to be smart and careful and come home again soon. He said it like he believed it, and maybe then he did. Sam believed a lot of things in the beginning, and he learned to repeat those things every time his parents called, even after he realized they were lies. And he never told them Ben Eielson crashed in 1929. And of course they never thought to ask. Some things never do change after all. If they were based in the Bush, flying out of a place like St. Mary’s or Aniak or Bethel or Kotzebue, then they flew with a specific set of habits. Out there it was about the snow and the ice and the wind. It was also about illusions, about pretending you could see when you couldn’t and accepting that no one else could see either. They learned to trust one another in those places, or at least to trust every sane guy and avoid the ones who were nuts. Mostly though, they just learned to hate it. . . . Along with the words, they also had to play the game — fly when it was legal but maybe not safe, and lie when it was illegal but definitely much safer. There was physical survival, job survival, and career survival to consider. Rarely did the three converge on any flight. They had to pick and choose which was most important and fake it when they made a mistake. Some guys figured this all out in the first day with the Company, but others never got it at all. If they were the kind to worry, there were a lot of things to be concerned about. The planes they flew were old and tired. The exteriors were patched, the interiors stained, and in a hundred different ways each of them was suffering from some sort of neglect. They were used for hauling sled dogs and snow machines as well as any other freight that fit, and they looked it. There were a lot of things that went wrong, and flying a broken airplance quickly became part of the job, just another test of loyalty in a place too cheap to do things right. I can still remember Tony coming back from every single Mount McKinley sight-seeing flight and his passengers going on and on about how spectacular the mountain was to see. I ask him how come the mountain is never clouded in when he’s flying, and he laughs and says the trick isn’t finding Denali on a good day but any mountain on a bad one. This book is hard to describe because I haven’t read too many others like it. It’s true-life adventure, but not one big saga like a trip to the South Pole. No, this is the story of people for whom life-and-death adventure becomes a matter of course, and all wrapped up in working for a Company that’s trying to make money and cutting corners to do it. Meanwhile, she talks as well about what drives the pilots today and the pilots of the past whose names are now legendary. And she makes it all fascinating. Source: This review is based on my own copy, ordered from Amazon.com. I’m continuing a weekly blog series, “Conference Corner,” where I share my notes from conferences. I’ve now finished the first big day of Midwinter Meeting, when I got to attend the Morris Seminar. Next up was the main conference. Midwinter Meeting is more about committee meetings than educational sessions, but there were still quite a few noteworthy sessions for which I will share my notes. First up was Susan Cain, author of the book Quiet: The Power of Introverts in a World That Can’t Stop Talking. They also gave us a copy of the book afterward, and we got to have her sign it. Since I read nonfiction very slowly – theoretically so I can absorb it better, but practically speaking because I’m reading lots of nonfiction books at a time and rotating them – I have not yet finished the book. When I do finish, I will definitely review it here. I have a feeling at a library conference there was perhaps an unusual proportion of introverts in the crowd. Susan Cain began her talk by discussing the main differences between extroverts and introverts. The primary difference is this: Where do you get your stimulation? Introverts are more stimulated by lower levels of sound, light, or other outside sources. Social stimulation is the highest level of stimulation. There are some profound advantages to being more easily stimulated. She talked about some big contributions to society that have been made by introverts. But recently there’s a strong bias against introverts. Many times, introverts try to pass as extroverts. This is a loss for us all at a social level. Even in the animal kingdom, there are introverts and extroverts. When introverted children are sitting quietly, they are paying more attention. They take in subtleties that others miss. Introverted kids know more than extroverts, even with same intelligence. Most creative people tend to be introverts, because solitude is an important catalyst for creativity, and introverts are comfortable being alone. 1)	Call for a world with more peace and quiet for everybody. 2)	Call for a world in which we enjoy and celebrate introverted children. 3)	We need to understand how much introverts and extroverts need each other. We need to come together and truly delight in each other. Dutton Books, 2012. 318 pages. I was already a fan of John Green and his books, but he has surpassed himself with this one. I think it’s funny that two books that I hope figure high in next year’s awards feature heroes August (in Wonder, a Newbery contender) and Augustus (in this book, which I would love to see win the Printz). Hazel meets Augustus at a cancer support group meeting that her mom makes her go to. But they hit it off well enough that she loans him the book and they start a relationship. John Green is good at portraying the clever banter of two nerds falling in love. Now, Hazel’s favorite book does not end well. She wants nothing more than to find out from the author what happens after the book ends. And Augustus wants to make that happen. Meanwhile, their friend Isaac, who has eye cancer, is about to lose his vision, and his girlfriend breaks up with him right before that happens. But there’s a whole lot more that happens, and I don’t want to say any more than that. I’ve heard objections that these teens use words that are too big even for adult readers — but those objectors clearly were not nerdy teens themselves. I know some nerdy teens, and dare I say I was one myself, and I remember the delight when you actually found someone who gets you, who lets you spout off your existential angst and crazy philosophizing. This book captures all that. Now, these are teens dealing with life-threatening illness. Normal adolescence has a good share of drama. You’re figuring out life and love and your emotions and what’s important. Adolescence with a life-threatening illness thrown in has even more at stake. So these are some teens for whom philosophizing is completely appropriate. “This is not so much an author’s note as an author’s reminder of what was printed in small type a few pages ago: This book is a work of fiction. I made it up. “Neither novels nor their readers benefit from attempts to divine whether any facts hide inside a story. Such efforts attack the very idea that made-up stories can matter, which is sort of the foundational assumption of our species. This book is brilliant. I only hope there are enough nerds on the Printz committee for it to get the recognition it deserves. Meanwhile, read it! Source: This review is based on a book I purchased at ALA Midwinter Meeting and had signed by the author to my son Tim. Egmont USA, New York, 2011. 345 pages. This is a fun and clever middle-grade fantasy. We’ve got that old fantasy stand-by — a girl with a gift of Natural Magic, the like of which hasn’t been seen in hundreds of years — but she doesn’t want to be her uncle the Wizard’s apprentice. She wants to be a detective. So, her uncle needs to find a new apprentice. When they’ve got the apprentices assembled to try out, something awful happens to her uncle, and Oona has a case to solve. The author keeps up the tone of the book throughout, and, yes, the things Oona encounters in the rest of the book are even more dramatic. “Presently, she turned her gaze north, and before her lay all of Dark Street, the last of the thirteen Faerie roads, connecting the World of Man to the fabled Land of Faerie. A broad cobblestone avenue more than thirteen miles long, the street stretched out in a continuous line, a world unto itself, unbroken by cross streets or intersections. The buildings rose up from the edges of the sidewalks like crooked teeth crammed into a mouth too small to fit. They listed and leaned against one another for support, giving the impression that if one of the buildings should ever fall down, then all of the others would quickly follow, toppling one by one like dominoes. “She considered the street for a moment, this ancient world between worlds, with its enormous Glass Gates at one end and the equally vast Iron Gates at the other. And yet of these two gateways, only the Iron Gates ever opened, and then only once a night, upon the stroke of midnight, when the massive doors would swing inward on hinges as big as houses, opening for a single minute upon the sprawling, ambitious city of New York. For the amount of time it took a second hand to travel once around the face of a clock, the Iron Gates remained open to any who should choose to venture across their enchanted threshold. Few ever did. Few ever even noticed. Shawn Thomas Odyssey keeps the story inventive, fast-paced, and clever. We’ve got detective novel elements like a locked room and a bumbling police chief and a super villain behind the scenes, but it’s set in this magical world and the fate of even the World of Men may be at stake. I read this book on the airplane flying from New York to Seattle, and it was a nice light-hearted yarn for the flight. It has some amusing elements like a clock that tells bad Knock-Knock jokes. I was inordinately pleased with myself when I figured out the riddle Oona needed to solve in the process of looking for her uncle. A lot of things that seem scary at first, like witches and goblins, end up being quite humorous. And some things you might not be afraid of, like a faerie servant, end up rather scary. This has the puzzles of a detective story, with some Fantasy tropes twisted and thrown in. I love that the book has the subtitle, An Oona Carte Mystery, because that implies there will be more. This will be a mystery series for kids I can get excited about! A Roc Book (Penguin), 2008. 398 pages. The Sevenwaters books showed all the signs of being a trilogy. So reading a fourth book feels like a wonderful bonus. Again, we’re looking at another generation of the people of Sevenwaters, in ancient Ireland. Again, the story has echoes of myths and fairy tales. This book features Clodagh, the daughter of Sean and Aisling. She must go into the realm of the Fair Folk first to save her brother, then for the sake of the man she loves. This book is romantic and mythic and an incredibly good adventure. The worst thing about these books is how hard it is to stop reading them. Once again, despite the title, this is the story of a young woman. A young woman who has dealings with the Fair Folk, who is strong beyond her years, and who will risk everything for those she loves. The 48-Hour Book Challenge Is Coming! Hooray! Mother Reader has announced this year’s 48-Hour Book Challenge! It will happen the weekend starting June 8. This time it’s not happening on my mother’s birthday weekend (the weekend before), nor is it happening on my birthday weekend (the weekend after). Now, it IS happening the weekend of my son’s prom, and I may need to be the chauffeur. But they will probably just have to listen to an audiobook on the way to prom! 1. I had a stroke almost a year ago. I was in the hospital for 10 days and then had lots and lots of days, over the course of the year, where I didn’t have the energy to do much besides read. Now thinking of spending a whole day or two reading doesn’t sound nearly as luxurious as it did a year ago. Instead, it makes me think of feeling bad! Solution? Well, I’ll just have to change that association, won’t I? Better read for two solid days when I’m feeling good, right? 2. As a consequence of all that time to read, but low energy to do other things — like write reviews — I’m way, way behind on writing reviews, so really I should spend the time writing reviews rather than actually reading — and that would turn it into a chore instead of fun. Solution? I am about to start a 3-day weekend with nothing scheduled. My son’s going to his Dad’s. Why not use this weekend to catch up on reviews? I will make the resolution that any books I have read but I haven’t finished reviewing by Monday, I will turn back in to the library *gasp* without reviewing! Then I will make a resolution from here on out to review books by the following Saturday after I read them. (This is writing the reviews, not necessarily posting them.) If I don’t review them by then, I will return them, un-reviewed. I will also plan to review every book I read during the 48-Hour Book Challenge. I’ll let you know how this goes, come Monday! The key will be that I will need to write the reviews of my favorite books first, or I won’t have the heart to turn them back in. There are some good books sitting there waiting, so I really hope I can accomplish this! I can think of it as a dry run for the 48HBC. Finally, one more thing about this year’s 48HBC. It’s also a read-a-thon, with donations going to Book People Unite, collecting money for Reading Is Fundamental. I’ll be sponsoring myself at $1.00 per hour. If you’d like to sponsor me, let me know in the comments or e-mail me at sondy at sonderbooks.com. I will definitely be posting how many hours I read. So, the excitement is building, and I’m going to prepare by doing my pre-challenge on the holiday weekend. I had been planning to get out and walk in a garden during the weekend, but then I saw the temperature forecast. I think I will happily stay indoors, writing reviews! I will post how many I finish on the weekend. In fact, I’ll even fess up and admit that my piles here have 14 full-length books and 9 picture books. That’s doable, right? Right? Henry Holt and Company, New York, 2009. 268 pages. Okay, when this book first came out, I wasn’t too interested. I grew up in a conservative Christian family, and didn’t exactly see Charles Darwin as a hero. Then the book kept winning awards, and got strong comments from the judges in School Library Journal’s Battle of the Books. I thought I really should read it. 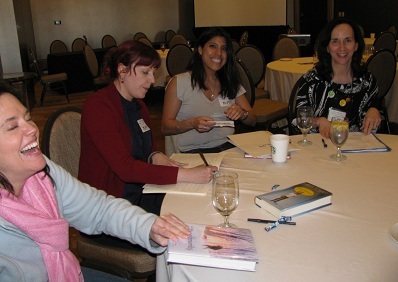 Then I met Deborah Heiligman at the 2010 ALA Annual Conference. When I found out why she wrote it, I knew I had to read it. I purchased a book and got her signature. However, it still took me until this year, when I was taking a class on the Printz Award, to finally get it read. “Jon’s been writing about science and evolution since we met. I had just graduated from college with a major in religious studies. We started talking immediately — about science and religion and writing and pretty much everything else — and we haven’t stopped since. Evolution is supposed to be opposed to Christianity, right? So how is it possible that Charles Darwin’s wife was deeply religious — and yet the two were very much in love. Deborah Heiligman tells the love story of Charles and Emma Darwin beautifully. It’s clearly a work of nonfiction — she relies heavily on letters and journals and notebooks written by the two of them — but it reads like a novel. Of course, in a story book, the marriage probably wouldn’t have worked. I found it especially interesting that Charles’ father advised him not to tell his new wife about his doubts about religion. But Charles couldn’t hide them from her. And she loved him anyway and even edited his books, including The Origin of Species. This book tells the story of how Charles Darwin’s scientific theories developed, but it especially shows us the man who loved his wife and children very much. And whatever your views, you can’t help but fall for the man presented here, and the wife who provided exactly what he needed to be such a distinguished scientist. This book is wonderfully presented. I like the quotations at the head of each chapter and the way Deborah Heiligman has arranged the facts in such an interesting manner. This book presents a compelling story that is all the more amazing because it’s true. Source: This review is based on my own book, purchased at ALA Annual Conference and signed by the author. I’m awfully behind on posting notes from conferences. And there’s definitely added value if I share what I’ve learned. So – I’ve decided to attempt a weekly feature – Conference Corner – to share what I’ve learned at conferences. It will be awhile before I catch up, especially since I’m going to ALA Annual Conference next month, and I still haven’t finished talking about the Morris Seminar, ALA Midwinter Meeting, and PLA Biennial Conference. One of the highlights of the Morris Seminar, a one-day seminar offered by ALSC to train people to be on book evaluation committees, was when we got into groups and practiced what we’d learned with books we’d read ahead of time. Here’s a picture of part of the group I was with. You can at least tell we were all having fun! After lunch, we listened to a Panel Discussion featuring past committee chairs from some different ALSC Award committees: Martha Walker, from the Pura Belpre committee; Julie Roach, from the Geisel committee; Mary Burkey, from the Odyssey committee; Rita Auerbach, from the Caldecott committee; and Cyndi Richey, from the Newbery committee. I took down some rather haphazard notes about the different committees. Below are some of the things they said. Geisel: You’re evaluating text and pictures together. The illustrations need to work for someone just learning to read. One committee member adopted a classroom to try out the books. Notable Committees: These are open committee meetings. Everyone’s equal when you walk through the door. You can learn about book evaluation by listening to these committees. Audiobook evaluation: Assume the book is good. Now look at the narrator and the story. You’re evaluating production quality. Was the narrator authentic and genuine to time, character, etc? “He said” “she said” should be dropped. Don’t want a “fake voice.” You shouldn’t perceive that someone’s reading into a microphone. Also think about the production quality. Don’t let a story you love blind you to the way it’s carried out. Recommended book: Listening to Learn: Audiobooks Supporting Literacy, by Sharon Grover. Rita Auerbach said she had less influence when she was the chair than when she was a regular committee member. The function of the chair is to keep things going smoothly. Read and respond on time. Respect other members and couch concerns as questions. Be willing to be cut off. Don’t make up your mind in advance. You can have an opinion, but at least be open to making your opinion change. Picture books are difficult to discuss. Cultivate the vocabulary for talking about art. Believe that artists, like authors, make decisions. When discussing, don’t go through the book page by page. Use post-its to mark what you want to talk about. Remember: There is room for interpretation. “Most distinguished American picture book” does not necessarily have the most distinguished art. Your basic premise is that the illustrator has done everything deliberately. How does it impact the book? What do you see? How does it make you feel? You can consider text, design, and everything else that goes into the book. Being on the committee builds mutual respect and trust between the members. Look at the role models in your life and seek out opinions. You will not remember what you read. Definitely take notes! Best advice: Keep an open mind. You’ll look at Suggestions and Nominations. This will be your most professionally satisfying experience because everyone’s read the same books. To get prepared, attend a Notable Books discussion. You can’t even have an appearance of a breach of confidentiality or conflict of interest. This is a literary award for literature for a child audience. It’s so important to listen! And listen without frowning. Being in a committee will help you to use and hone your skills. You’ll use them for a lifetime. Hyperion Books for Children, New York, 2012. 36 pages. Oh, Mo Willems is a genius! I never get tired of his books. This, in case you were wondering, is another book featuring the Pigeon. It’s got a lot of the same elements that worked in previous books, including a throwing-a-fit page. Toddlers, kids, and their parents will easily relate to this book and understand the problem right from the title page. 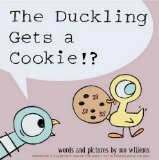 Then, on the beginning pages of the story, the duckling asks, very politely, for a cookie. And gets one! With nuts! Then the pigeon discovers that the duckling got a cookie just by asking (politely). This is obviously not fair, since the pigeon asks for things all the time. I especially like the part where he recites some things he’s asked for, like a walrus. (He definitely does not mention the Puppy.) He begins to get worked up. He rails at the unfairness. He throws a fit. He cries. He rages. He pouts. And the ending? You may be able to guess, but it is absolutely perfect. While being written on the level a toddler can relate to, this book has so much to offer older readers, too. And toddlers themselves will find so much to talk about in these pages. Those who are already familiar with the Pigeon will have fun finding the references to each of the earlier books. I have a strong feeling that if I am ever a grandmother, I am going to feel the need to own a copy of every single Pigeon book to keep in my house for reading to the grandchildren. Of course, in the meantime, I get to read to library members. Even if you don’t run out and buy this book for your own toddlers and preschoolers (and, come on, you really should! ), be sure to at least do them the favor of checking it out from the library and enjoying these new antics with them. You are currently browsing the Sonderbooks blog archives for May, 2012.